EXCLUSIVE Our springtime garden comes to life with vibrant color. Set in our watercolor garden-inspired planter, this lively mix includes a cheerful white daisy, sunny yellow kalanchoe, and striking orange Gerbera daisy. 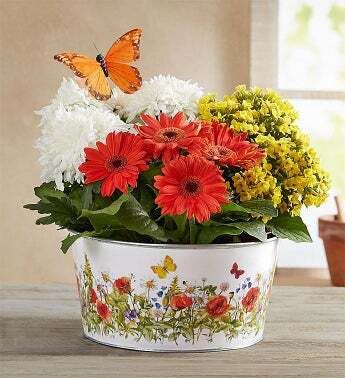 And because no garden is complete without a beautiful winged visitor, we’ve included a lifelike butterfly pick, adding to the charm of these beautiful blooms.